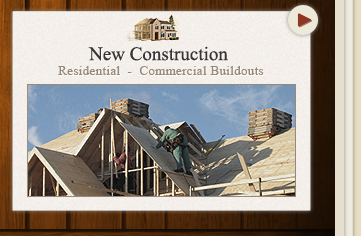 Remodeling Contractors in McHenry, Illinois Residential Building Co. 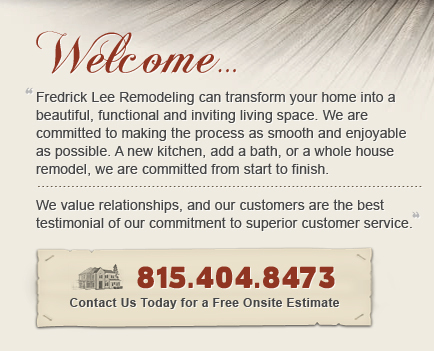 Welcome to Fredrick Lee Remodeling! 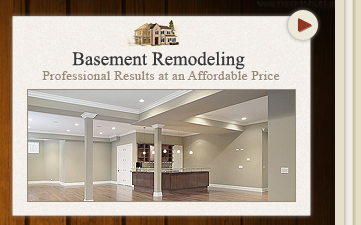 We are a full-service Remodeling Company based in McHenry, Illinois. 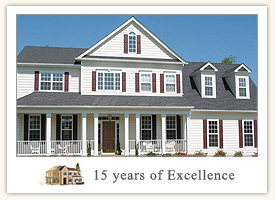 For many McHenry homeowners, we are pleased to be their "contractor for life." For more than fifteen years, we have been focused on providing homeowners with innovative design, meticulous craftsmanship and high quality, personalized service. Our McHenry Residential Building Service professionals work side-by-side, providing clients the convenience and confidence of a single team with a shared vision. With Fredrick Lee Remodeling, Our McHenry Remodeling team works on your remodeling project - from first draft and design concept through final construction cleanup - with a single point of contact for you. Together we are able to deliver award-winning design, quality craftsmanship and a predictable process. We want you to feel at ease and stress-free throughout the McHenry Remodeling process. We invite you to join our team and encourage your involvement through each step of the process. Our philosophy about estimates and budgeting is to give our customers realistic cost estimates, early in the process, and minimize any later surprises. 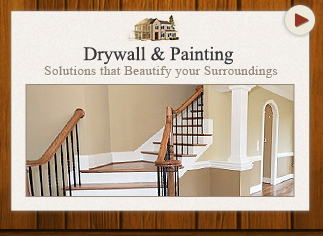 We strive to build a strong, productive relationship with you as we work together on your home. 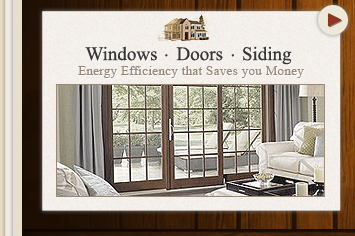 Our McHenry Remodeling team understands your Remodeling project is an important investment. We provide a dedicated team of local McHenry General Contractors to help protect your investment. Whether you require a complete start-to-finish design, or already have plans, we can help you achieve your McHenry Remodeling dreams. Creating great McHenry Residential Remodel takes a lot of experience. 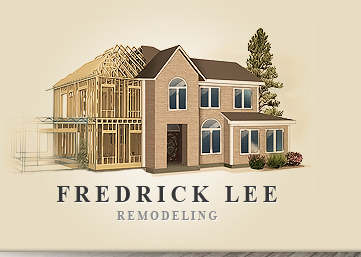 Fredrick Lee has the experience crafting the most creative, beautiful, and stylish Remodeling Projects for our customers no matter what they're hoping for. As a family owned and operated business, we truly understand the value of creating long lasting, high quality customer relationships. That's why delivering the perfect customer experience is so important to us, and why we work hard with our qualified, helpful and friendly McHenry Residential Building Service professionals. We apply a detailed, thorough process to each of our projects which helps to guarantee consistent high quality results for your McHenry Residential Building Service experience...every time. We understand that you've been thinking about your McHenry Remodeling project for some time now, and we take a lot of pride in helping to develop your ideas and transform the house that you have, into the Remodel that you've always wanted. We're dedicated to being the Best McHenry Residential Building Service company for you, and do everything in our power to ensure that you're absolutely happy with our McHenry Remodeling services from the start. From our friendly consultation conversations and the delivery of an accurate work estimate, to creating detail oriented McHenry Remodeling plans and obtaining all the necessary permits, all the way through construction, cleanup and a meticulous walk-through to ensure that all your expectations are met, it's obvious that our McHenry Remodeling process is built around customer satisfaction. 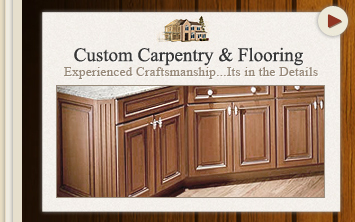 Serving our customers throughout each McHenry Remodeling project is our priority, and we're sure that you'll agree. When you're ready to get started on the perfect McHenry Remodeling project for your home remodeling, we're here to help! Our dedication to great customer service goes beyond using the highest quality products and the most experienced, expert McHenry Residential Building Service professionals. We work hard to make sure that you're absolutely comfortable with each step of our process. To us, customer service is more than just a company policy. It's an attitude that we work hard to engender in each member of our team. When you're ready for a great McHenry Residential Building Service Company and truly superior customer experience, please give us a call for a friendly discussion and free onsite estimate. Fredrick Lee is a general contractor specializing in Remodeling in McHenry, Illinois that will help you make the right decisions. Whatever your McHenry Remodeling project idea, we’ll work with you to realize your dreams. You can invest in your current property by complementing your living space with an impressive McHenry Residential Remodel ...And we can make it happen. Successful McHenry Remodeling and whole Home remodeling require a reliable and proficient company you can trust for a major project. 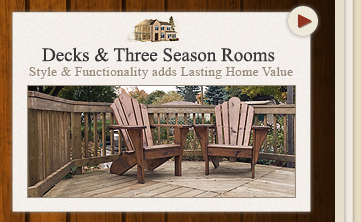 Fredrick Lee Design and Remodeling has extensive experience with Remodeling and Home Additions. Our dedicated team brings you all the expertise you need for designing and building both the exterior remodeling and interior remodeling for your Home and McHenry Remodeling project. We also specialize in single and second story additions designed to blend architecturally with the original structure, an important consideration when designing an McHenry Residential Remodel or Home Addition. 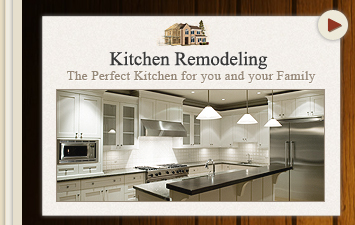 Look to the Best McHenry Remodeling team in McHenry, IL. If you have been dreaming of a McHenry Residential Remodel that's not only practical and attractive, but also serves as extra space for you and your family...the McHenry Remodeling experts at Fredrick Lee can help you. Our McHenry Residential Remodels are one of a kind and our McHenry Remodeling Contractors can turn any ordinary Remodeling project into a the environment of your dreams. We believe that your McHenry Remodeling experience should not just serve its functional purpose, but also be a beautiful and relaxing place of retreat. With over 15 years of McHenry Remodeling experience, Our McHenry Remodeling experts understand that this type of Remodeling Project can be an important part of the House. Remodeling in McHenry - Remodeling is one of our specialties, considered by many as an investment in your Home's value. We agree, but, we believe that McHenry Remodeling is more of an investment in your family’s future. Why go through the pain and expense of a major McHenry Residential Remodel if you only intend to sell your Home soon after? Instead, consider any McHenry Residential Remodel in McHenry, Illinois for your own enjoyment. Wouldn't you rather enjoy the new space and amenities now and for years to come? At Fredrick Lee, Our McHenry Residential Building Service experts make it a top priority to minimize the inconvenience of a Residential Remodel by staying on schedule and making sure the work area and surrounding areas are kept clean and organized. As always, our goal is to provide the best McHenry Residential Building Service in the industry...while providing you with a perfect end result. We have been in the McHenry IL Remodeling business for years and have witnessed the Remodeling transformation. Beautiful Remodeling is now an integral part of any McHenry Remodeling project. Since we’ve been serving McHenry, IL, Remodeling have never been so popular. Home owners are realizing just how much time the family can actually spend in this extra space...and they are responding by turning to us. Are you just starting out your McHenry Remodeling Project? If so, it's easy to understand that the first step for us is working with you on your custom McHenry Remodeling design. The Remodeling design can involve making design decisions, laying out the structural elements, and deciding on exterior elements of the Residential Remodel as well. The design aspect is an important step for our Residential Building Service experts in McHenry, Illinois because we strive to work with you to create McHenry Remodeling that reflects your taste and personality. Not sure what you want your McHenry Remodeling Project in McHenry to look like? If you are looking to remodel at all...and are thinking about contacting our McHenry Remodeling, it is a good idea to have an idea of the type of Residential Building Service design style that you want to achieve. But don't worry! We are always happy to offer onsite Residential Building Service ideas in McHenry, Illinois and surrounding areas. We live in a world where personalized service is fast becoming a “lost art” form and we welcome you to experience the difference our McHenry Residential Building Service experts “personal touch” can make on your next project. Why settle for less? Let Fredrick Lee turn your next McHenry Remodeling project into a beautiful and rewarding experience. When embarking on your new McHenry Remodeling project, many Home owners don’t know quite what to expect. As soon as the demolition begins, the anxiety level rises. We understand this. After all, your Residential Remodel is in a state of transformation and this stage can be an adjustment. We’ve helped many McHenry Residential Building Service clients get through there Residential Building Service experience and we will do the same for you. One of the best ways to alleviate anxiety is through communication and advanced preparation. We’ll let you know what to expect. From start to finish, you will be informed every step of the way. Combine this versatility with a long term commitment to customer service in McHenry, Illinois and it’s easy to understand why the majority of our McHenry Remodeling business comes from referrals from previous customers. Along with creating a visually stunning and a beautiful McHenry Residential Remodel for you, we will also make sure that it functions well...and lasts as long as possible. Many of the Remodeling projects that we perform in McHenry are fixes for other companies that over-promised and under-delivered – leaving Home owners in need of a new McHenry Remodeling Contractor ...who often times has to start from scratch. 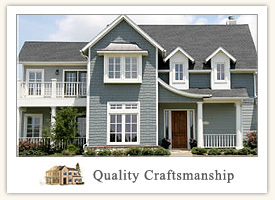 As one of McHenry Remodeling experts, we have earned a reputation for quality workmanship and customer loyalty. 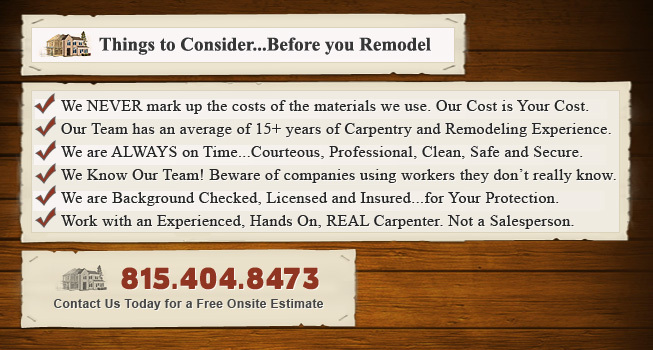 You will think of it as a McHenry Remodeling Free Estimate. We think of it as our opportunity to shake your hand, look and listen. What do you need in a McHenry Remodeling expert? What do you dream of? We know that at the end of our first conversation, you will feel that we share your dream and the excitement of your McHenry Remodeling project. When looking over your McHenry Remodeling project, Our core value is always honesty. This is the essence of our free estimate, which can only be determined honestly when we know your vision and bring our experience to bear on determining costs. We believe in a quality team of carpenters and realistic timelines. Our satisfaction guarantee includes eliminating any need to come back and fix something right after we leave, and it includes delivering your fantastic new McHenry Residential Remodel on-budget. Why? Because we rigorously plan all phases of the project, and make certain you know what is next. 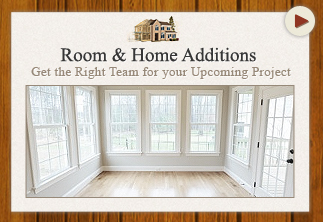 We will keep you informed and up-to-date with every detail of your McHenry Remodeling project. 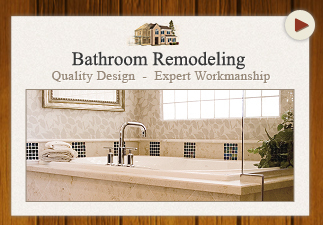 We provide an easier, smoother, and more cost-effective Remodeling experience. If you are serious about finding the best in quality and innovation at a price you can afford, Fredrick Lee Remodeling is the McHenry Remodeling company for you. Contact the Reliable McHenry Remodeling team / General Contractors at Fredrick Lee Remodeling at 815-404-8473 for any of your upcoming McHenry Remodeling project.